At this time of the year, many people get all excited about sports. Hockey, basketball, and especially football. The end of the football season is upon us! There are many different types of positions on a football team. I was wondering: how good would a team be if all of the players were big and bulky, like offensive linemen? Or, how about if all the players wiry and nimble, like wide receivers? How successful would a team like that be? The Apostle Paul told the church in Corinth about another group, or team. Except, he called it a body—God’s body. God put together all the different believers into a team, or body called the church. God’s team. When we consider our passage for today, we can also see that God made different kinds of gifts, as well. God’s plan is for human beings to live together in one body. That is, with one another, in a great big community. What on earth is Paul talking about? A body? Why is he mentioning a metaphor like that? Well, he was responding to a letter from the church in the city of Corinth. He had spent a number of months in the city, teaching and preaching. Then, he went on his way to other towns, to spread the Good News of Jesus Christ. He was an itinerant preacher and missionary, after all. I suspect Paul had a great number of people sending him letters, asking him questions, wanting his advice about continuing problems in the various churches he had founded. A number of things were the matter with the church in Corinth. In his letter, Paul tried to correct several issues, including this important issue about spiritual gifts, and unity in the church. Reading from chapter 12 of 1 Corinthians again: “12 Just as a body, though one, has many parts, but all its many parts form one body, so it is with Christ.” That’s Paul’s main point! Yes, we in the church are one body! Yes, we in the church have different strengths, and roles, and gifts! Just like a body has many, many different parts. Those different parts do countless tasks. Certain parts of the body are versatile! And, other parts of the body do just one thing. But, that doesn’t make any smaller part any less a part of the body. Big parts, important parts, little parts, behind-the-scenes parts. All different kinds of parts of the body. One of my favorite commentators had a radio program for years. J. Vernon McGee broadcast a show called “Thru the Bible,” in which he would do just that; methodically go through the Bible in five years, teaching and giving comments in his homespun, aw shucks kind of way. This Presbyterian pastor Dr. McGee had incredible insights! We all are probably familiar with a popular children’s toy. Put out by Hasbro, small children have played with it for decades. Made even more famous by an appearance in all three Toy Story movies from Pixar. Mr. Potato Head, accompanied by his partner, Mrs. Potato Head, of course. You remember how Mr. Potato Head works. A large potato. And, the separate parts of the body: eyes, ears, nose, mouth. Hands, feet. Reminds me quite a bit of the Apostle Paul’s metaphor of the Church, the body of Christ, doesn’t it? But what if our Potato Head had all eyes, and no hands? Or, all ears and no feet? What then? Would it be all lopsided? Wouldn’t work properly? Just imagine if our local church, St. Luke’s Church, was all lopsided like this? Wouldn’t work properly? Not only is the Church meant to have unity, or work well together, it is also made up of diverse or different parts, on purpose! Looking back at Genesis, we can see that diversity is definitely in God’s plan for humanity from the very beginning. The sheer creativity of God in creation is so big and so varied. A countless variety of individuals made in every size, shape, color, ethnicity. Having endless variations of gifts that God gave to each of us. The only way I can figure this, is God is pleased when we use our God-given creativity in any one of a myriad of ways—inventing, designing, doing, helping, making, thinking, crafting, composing, giving. And when we use our God-given gifts, it plain feels good inside. When we look at this chapter in 1 Corinthians, Paul stresses that the church—the group of believers in Christ he was writing to—in all of its diversity, is a community. A great, big extended family, if that helps you think about it in that way. I know that can remind us of the whole topic of the families each of us were born into–and some people don’t want to go there—with in-laws, out-laws, black sheep, and all the rest. But biblically speaking, this is God’s family. Unity? Yes! Diversity? Again, yes! There is a wrinkle in this happy, unified picture the Apostle Paul paints for us. I suspect you are already thinking about it. I know the Apostle Paul didn’t study different approaches to mission or worship, like people in seminary do today. He was more immediate, and I suspect more of a nuts and bolts kind of guy, for all his education and fancy titles. He talked in our passage today about the unity of the Body of Christ. He knew about diversity, since many of the groups of believers he preached to were just that—diverse, with people from all different strata, coming to faith in Jesus Christ. Yes, there is diversity! Yes, we are all different from each other. And, yes, we are all one in Christ Jesus. We can celebrate that blessed reality today! Just imagine. Just imagine what a marvelous job each Church could do, if each member used what God had given to each one, to the best of their ability! What an opportunity for ministry! What an opportunity for outreach! What possibilities lie before us as a church, as the Body of Christ in this place? May each of us prayerfully ask what God would have us to do with the gifts God has given each of us, today. Amen, alleluia! McGee, J. Vernon, Thru the Bible with J. Vernon McGee, Vol. V, 1 Corinthians—Revelation (Nashville, Thomas Nelson Publishers: 1983), 60. Suggestion: visit me at my sometimes-blog: matterofprayer: A Year of Everyday Prayers. and my other blog, A Year of Being Kind . Thanks! Weddings are so often a joyful time! Busy, yes. Stressful, yes. But joy-filled, too! Have you ever known a wedding where something unexpected happened? I mean, a mistake happened, or something just went plain wrong? These are just a few things that actually happened to a real-life pastor, the Rev. Dr. Alyce McKenzie. The groom and best man got to the church on time, but they forgot to bring the suit for the 6-year-old ring bearer. The matron of honor had surgery a little too recently to be standing for a long time and collapsed during the vows. The pastor got the time wrong and showed up an hour late for the wedding. This last one happened at the commentator’s daughter’s wedding a few years ago. Can you imagine what kinds of consternation this might cause at a wedding? Surprise? Frustration? Embarrassment? Imagine that wedding in the town of Cana, at the very beginning of the ministry of Jesus. It doesn’t so much matter when the wedding was celebrated, then or now. An awful problem, no matter where or when. Except, even more so in the Middle East, where hospitality is such an important, foundational part of life. Today, we know how important it is to offer guests something to eat or drink when they come to our homes for a visit. Think of that, and then multiply it. Times ten, and even more. I suspect not only many of the local townspeople were there, but also friends and relatives from near-by towns. We read in the Gospel record that the Rabbi Jesus was also there, with His disciples. And, His mother was invited, too. Large crowd of people! Reminding everyone, in the first century, Jewish custom held that most any wedding would be an event of celebration for several days. Our Scripture passage today shows a wealthy Jewish family—with a number of servants and a household steward. Imagine the huge amount of time and the money that went into a celebration of that size. Plus, the logistics! We read that the family provided extravagant feasting for days. In the case of today’s Scripture, if there were any miscalculation or lack in provisions in food or drink, not only the bride and groom but also their families would most likely suffer great humiliation. And what if—God forbid—something should go very wrong? What then? The surprise, the frustration, the embarrassment that potentially could happen at that wedding celebration in Cana. John begins his narrative in the middle of things. He opens the scene on the third day of the wedding feast. The party is in full swing! And it is a party. Huge celebration. The miracles in John’s gospel are called signs; they show everyone Jesus the Son of God, and His Godly power, might and glory. As commentator Nancy Rockwell said, John’s signs deal with ordinary human things, set in the course of human events. Like, a wedding feast. And the Son of God, the Divine Word made flesh, is human, too! He enjoys Himself at a big party, with His friends and family. His mother Mary comes to her Son—I suspect quietly. “When the wine was gone, Jesus’ mother said to him, ‘They have no more wine.’” What’s to be done? This is a huge problem, and a terrible embarrassment to both families! Talk about public humiliation! Mary knows very well what is going on. So, she goes to Jesus for assistance. When we have problems, or embarrassment, or difficulty today, how do we handle it? Do we keep it to ourselves? How about sweeping awkward problems under the rug? Or do we do what Mary did? Do we go to Jesus? Yes, I could tell you about the expression Jesus uses to address His mother—“Woman,” which can be a term of respect. I could talk about the way Mary sidles up to the servants and tells them “Do whatever he tells you.” But, instead, I want to focus on the large stone jars that Jesus used. These were six large containers of water with anywhere from twenty to thirty gallons apiece. There was a large crowd gathered at the party—or, banquet. Jewish ceremonial tradition demanded that there be a large amount of water nearby for observant Jews to wash ceremonially before they ate. Jesus knew all about this custom, and He told the servants to fill the jars. Let’s say there were twenty gallons in each one. That was one hundred twenty gallons of water, just waiting! As Nancy Rockwell said so well, Jesus responded to His mother’s compassion for her friends. Jesus replenished the wine! Notice He did not shake His finger at the crowd for enjoying some wine. Neither did Jesus sneak out the back door, not wanting to have anything to do with such a “shameful happening.” Imagine, not having enough wine for a big, multi-day celebration like this! Instead, Jesus replenished the wine. Over one hundred gallons of it! He allowed the party, the feasting, the celebration to continue. He stepped into potential humiliation and family embarrassment at a significant event in the town of Cana. Jesus transformed it into something abundant. Jesus worked a miracle! Another way of looking at it is that God abundantly provided for this situation at the wedding party. God reached out and touched this event, transforming it into something miraculous. Jesus transformed the potential injustice and embarrassment of these families into something wonderful. I remember another situation, another place, another time, where injustice, frustration and embarrassment were gradually transformed into something amazing. Dr. Martin Luther King Jr. and his words, and his actions? Transformed our country through the miracles of what was accomplished through the civil rights marches, through Dr. King’s earthshaking speeches and sermons. What a transformation, taking something hurtful and potentially embarrassing, and transcending the flawed and faulty world. Thank God! God’s Son saw fit to provide for this family situation at the wedding. Jesus can provide for us when we get into embarrassing situations, or difficult situations. Let’s thank Jesus for His love and care for each one of us. For reaching out and giving abundantly from God’s overflowing resources. It’s a joyful day indeed when we celebrate a baptism in church. We follow the command of our Lord and Savior Jesus Christ, showing to all an outward sign of an inward change. Here in this church, we often celebrate infant baptism, showing the sign of God’s grace to all who are present. The congregation has an important part, too. They promise to teach the little one the ways of God, and to help the family bring up the child in a manner pleasing to God. Truly, a joyful, grace-filled sign and sacrament! Well, that’s today, here and now, a long time after the first century. That’s one common understanding we now have of baptism. Our Gospel reading today features John the Baptist, baptizing people in the wilderness. John was a prophet of God. He was set apart for a special purpose, to give out a special message from God. Here John the Baptist preaches to the nation of Israel, before our Lord Jesus has even started His ministry. This message ought to be familiar to most of us. We heard some of John’s prophetic message read as our Gospel lesson only a month ago. Doom and gloom! He identifies everyone in the crowd as part of the brood of vipers—as sinners! Exactly what John the Baptist has been saying to the people of Israel for some time. Another way of looking at John’s message is: “You are dirty, inside and out! Come get clean, both symbolically and physically!” Through God’s grace, John offers the people the opportunity to be obedient and to clean up, to show God and to show others that they repent and turn from their sinful, wicked behavior, speech and thinking. Many people respond. It’s a mini-revival going on at the River Jordan. Amen! Hallelujah! Let’s pull back for a moment, and consider the larger situation. John does not mince words. He does not pull punches. John identifies his listeners as a brood of vipers, as sinful and separated from God. John tells the people of Israel straight out, ““I baptize you with water. But one who is more powerful than I will come, the straps of whose sandals I am not worthy to untie. He will baptize you with the Holy Spirit and fire.” John the Baptist responds with a clear message: he offers the people baptism to remedy that flawed, sinful, separated identity. They can identify themselves with God, and be identified as God’s beloved children. And then—and then—Jesus shows up. Jesus is about to begin His public ministry. But before that happens, He comes to the River Jordan to listen to His cousin John the Baptist. And, to get baptized. Lo and behold, the companion Gospel accounts of Matthew and Mark tell us that John is surprised to see Jesus there. But Luke’s account makes Jesus’s appearance natural. The next right thing that happens. Verse 21 says, “When all the people were being baptized, Jesus was baptized too.” At first, John is the star actor, the one doing the main action of baptizing. Jesus is the next one baptized, along with many others. However, what happens next? Can you see this on a movie screen? We open to a wide shot of the River Jordan. Large crowd of people on the river bank, and a number lined up in the water, waiting their turn. John the Baptist in a rough woven tunic with a leather belt around his waist. John is doing his thing—baptizing people who have repented of their sin. And—Jesus is one of them. The camera pans in to a close-up shot on Jesus. Next in line. John slowly takes Jesus, baptizes Him. We are not sure whether John dunks Jesus in the water, or whether he pours water over Jesus’s head. (I prefer the idea and the image of pouring the water.) Regardless, everyone gets pretty wet. Next thing we all know, the heavens open wide. Just in case anyone was not sure, God’s own voice tells us the identity of Jesus. Jesus is God’s own beloved Son. Not only that, but God is well pleased with Him, too. Plus, the Holy Spirit as a dove is a visible and physical sign of the presence of God. God not only proclaimed Jesus’s identity, on the banks of the Jordan River, God also proclaims our identity. We belong to God. It is not our doing, but God’s, instead. Did you hear? Do you understand? No matter what happens, or how often we fall short, we cannot erase or eradicate God’s love. We love God because God first loved us. God has given us that sign, that seal of baptism, sealed by the Holy Spirit. It does not matter whether we have been brought to baptism as a baby or a child, or have come as a young person or an adult. Perhaps there are people here who have not been baptized yet. God calls for all to be baptized. God calls for all of us to remember our baptism, as well. Preaching a More Meaningful Baptism – David Lose, https://www.workingpreacher.org/craft.aspx?post=1624 . I remember Christmases when I was very young. I was the youngest of six children, and we lived on the northwest side of Chicago. My father worked for the National Safety Council, which was a not-for-profit organization. He didn’t get paid a huge amount of money, so I remember Christmases when we children wouldn’t have a huge pile of presents under the Christmas tree, like the television commercials of today always seem to show. But I do remember the happiness and joy of those Christmas mornings. A number of gifts were exchanged, and we always had a big dinner later that day at one of my relatives’ houses. Those are warm memories, all of us gathered around the tree, exchanging presents. Warm memories. I’m sure you all could bring to mind a similar warm memory or two, regarding Christmas. Many of my memories do involve gifts. The Scripture passage we just read mentions gifts, too. It’s from Matthew, Chapter 2, the traditional Epiphany story, when Wise Men from the East came to see the baby Jesus, bearing gifts. Matthew calls them “Magi,” According to my research, they probably came from the East where the Jews had spent seventy years in the Babylonian captivity, centuries before the birth of Christ. During this period, the Babylonians and Persians probably learned of the promise of the “Messiah” from Daniel the prophet who had lived among them. The Magi became important first among the Medes and later among the Persians by taking on the priestly functions of the mystery religion Zoroastrianism. By New Testament times, the term “Magi” was broadly used for persons adept in any number of sacred arts, including interpretation of dreams or other divine messages, astrology, magic and divination. 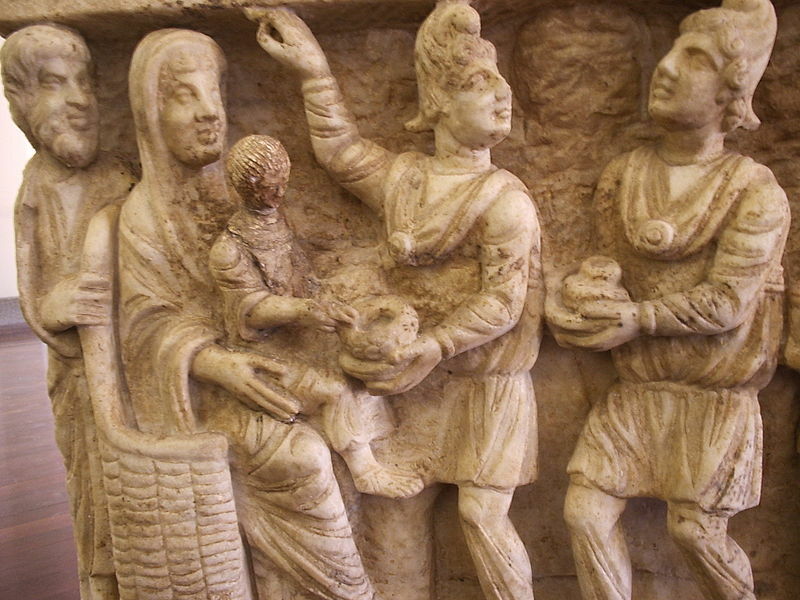 We can tell from the term “Magi” that here are three very important people, who are not Jewish. The consensus among biblical scholars is that Matthew was a Jewish apostle of Jesus who wrote his gospel for the Jewish people. Yet, here, front and center in the beginning of the Gospel of Matthew, we find three non-Jewish V.I.P.s, on their way to see the Child, born King of the Jews. They know pretty much where they are headed, but not precisely. I suspect that is why the Magi went to see King Herod in Jerusalem. I mean, what better place to find a newborn King than in a palace, in the capital city? I’ve got to give these Wise Men a lot of credit. Not only were they a little fuzzy as to their destination, and where they were going, but they were not afraid to ask questions and ask for directions. It’s too bad that they had to pick Herod to ask questions of. The Wise Men saw the bright star announcing the birth of Jesus, and followed the star towards Jerusalem. Notice: they were not Jewish, yet they had heard of the Coming One, and even brought Him gifts. They even wanted to worship and adore Him. They had heard of the birth of Jesus through unconventional methods, by our standards. The Magi had foreseen the birth through signs in the stars, not necessarily through the Hebrew Scriptures, as the Jewish people had. God understood that these Wise Men made a careful study of the stars, and He sovereignly decided to display signs and wonders in the heavenly places at the time of the birth of Jesus. God reached these Magi where they were at. And the wonderful thing is, God continues to reach out to people in ways they understand, no matter what is happening to them, no matter where they might happen to be. Herod must have known something about the prophecies of a Coming One, of a Messiah, and I bet Herod was upset. The chief priests and scribes came to Herod and told him right away where the Messiah was to be born. The prophet Micah had foretold it several centuries before. In Bethlehem, in Judaea, only a little way down the road from Jerusalem. From all accounts of Herod and his life and reign, he was a tyrant. Looking at writings from contemporary authors of that period, Herod was cruel and bloodthirsty. He was also two-faced, as we can see from his response to the Magi. He sent the Magi to Bethlehem, and requested that they come back after they find this “King of the Jews,” because Herod wished to “worship” this King as well. I have a pretty good idea of exactly what Herod wished to do to the baby Jesus. The Gospel of Matthew tells us that Herod secretly found out the time the star had appeared in the sky, and typical of a bloodthirsty despot, he had all boy babies in the area of Bethlehem under the age of two killed. Just in case. This feature of the Christmas story usually isn’t mentioned, since it doesn’t fit into a nice, warm and fuzzy Christmas card. These verses are not included in our lectionary reading for today, either. Yet, this was the kind of world Jesus was born into. The world today hasn’t much changed. Let’s pick up with these Wise Men. After they found out where the King of the Jews was born, they wasted no time in finding Him. Mary and Joseph must have decided to stay in Bethlehem for a time, since the Wise Men found the Holy Family inside a house. And, the original Greek of the Gospel of Matthew refers to Jesus as a boy, not as an infant, as the Gospel of Luke does. So Jesus may even have been a toddler at the time of the Wise Men’s visit. Regardless of these minor, yet fascinating, details, the important part is that the Wise Men took the time to find the promised King of the Jews. When they found Jesus, the Wise Men were finally able to offer their gifts—gifts fit for a King, gold, frankincense and myrrh—expensive and costly gifts, to be sure. Then . . . the Wise Men worshiped Jesus, the Promised One, the coming Anointed One of God. And, they returned to their homes, rejoicing that God’s promise had been fulfilled. What does this story from so long ago have to do with us, today, in the 21st century? God is indeed pleased when we give Him things we very much value, as the Wise Men did. But God doesn’t really want worldly things. What I see repeated in Scripture is that God really wants a relationship with us. Christina Rossetti’s poem says it so well. That’s what God wants most of all for Christmas. God wants our hearts. God wants us to come to Him, as small children come to a dear mother or father. I can remember when my children were small, and they would come to me at night for a last cuddle before bedtime. I think that’s what God wants us to do. Only, better! God is a parent who will never be too busy to take time for us, and never be short-tempered with us. God’s everlasting arms are ready, wide open to receive any who come. Yes, the Wise Men gave gifts to the baby Jesus, and yes, they stand as an example for us. We can celebrate their example, and remember it as we give our hearts to God, whether as a renewal gift of our lives, or as a sincere gift for the very first time. Give God the best gift you ever could. Yourself. You are important, so important that Jesus came and gave Himself for you and for me. All He has ever wanted is to give us the chance to know Him as a personal Friend and Companion. Won’t you give Him what He wants most for Christmas?